I had heard of Penfolds re-corking clinic but really didn’t know what it entailed. I just assumed people would bring in their old bottles of Grange and have the cork replaced periodically. 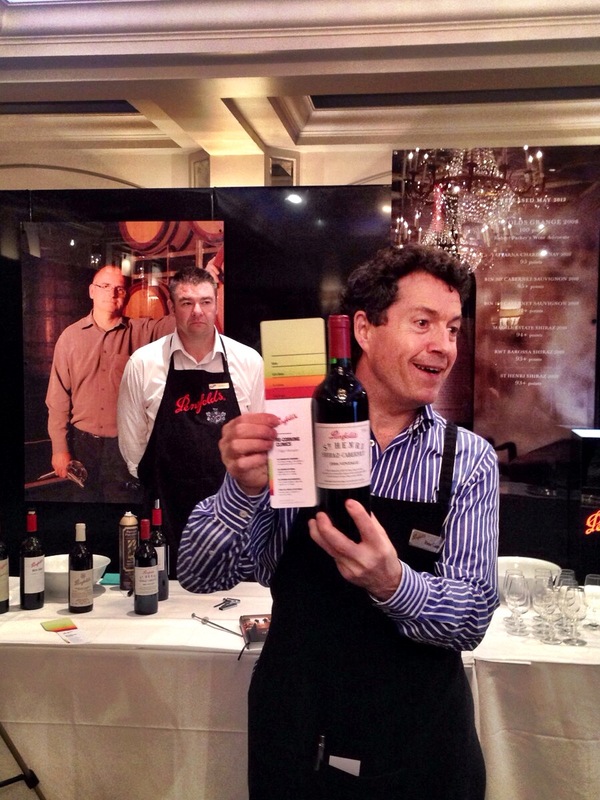 Not so, as I found out when I was invited to see how a Penfolds re-re-corking clinic actually works. Chief Winemaker, Peter Gago was in attendence (he attends all of the Penfolds clinics around the world and examines many bottles personally) , along with 3 other Penfolds winemakers. They had set up shop in the ballroom of the Berkeley Hotel in Mayfair for a day of re-corking. Peter bubbled over with enthusiam while explaining the entire process to us. It turns out that Penfolds will only re-cork a wine once in it’s lifetime and have a very strict traceability system in place. 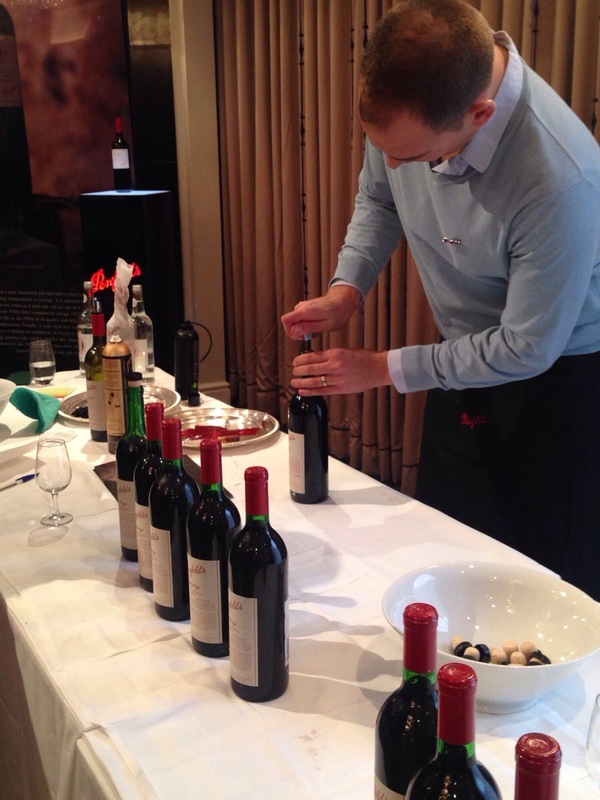 Peter explained that once an old wine has been opened and certified, they refill it with 15 mls of the current vintage. This translates into 2% of new wine which will not affect the wine. 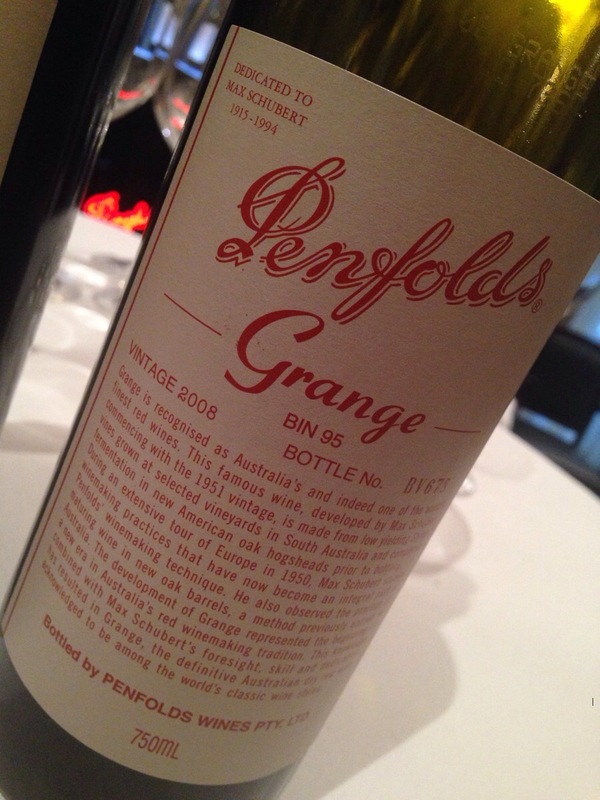 Imagine if you had the wine re-corked every few years, after awhile, it would no longer be a 1950-something Grange, it would be something entirely different. Peter said that in the past they used to have difficulties persuading people that they should wait to have their wine re-corked but now they have a handy coloured guide which they can use to measure the amount of wine in the bottle. If the level falls below a certain zone, they will re-cork it, otherwise, they advise the owner to come back next time. The clinics are not only a chance to check on the state of a particular bottle but also a chance for Penfolds to hold what Peter calls “authenticity” clinics. In China, Penfolds does 3 day clinics where people have the opportunity to not only check on the vintage but also ensure that what they have really is a Penfolds wine. The clinics are also a chance for Penfolds to educate the consumer , informing them about “drinking windows” and what that means. It’s also about getting people to open their wine and enjoy them in the here and now. People often say they are saving their wines for a “special occasion”. Peter thinks that now is as good a time as any because who knows what the future may hold. The Penfolds winemakers not only assess the wine but they often act as councellors and/or therapists to their clients, as some can get quite upset if their cherished wine is deemed no longer drinkable. If the wine is deemed as at it’s peak or maybe even a bit past it, it gets a “white dot”. This means they should drink it now as it won’t improve with age. Peter said many people are quite relieved to get a “white dot” because this gives them permission to drink the Grange or St. Henri that they’ve been carefully guarding all those years. Why do they hold the clinics? Peter says he does it to engage with people who buy and drink their wines. He sees it as a bit of theatricality in the world of wine. It’s also gives the personal touch that you get when you buy a bottle of Penfolds. They’ve been doing the free clinics, all over the world, for 21 years and Peter plans to keep on doing them for as long as he can. The last time they were in London was 5 years ago but Peter believes that after this rather successful re-corking clinic this year in London, they may be back again next year. So if you missed Peter and gang this time around, fingers crossed they come back in 2014.